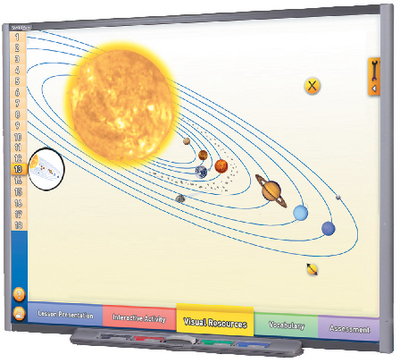 This digital lesson covers topics that depict the characteristics and concepts of our solar system, including Formation of the Solar System, Geocentric & Heliocentric Systems, The Sun, The Inner Planets, and The Outer Planets Comets, Asteroids & Meteors. Also includes Virtual Lab Investigation: Exploring Our Solar System. Recommended for grades 6-12. Meets national science standards and state standards for California, Florida, New York, and Texas.